Mariners Latest: Rookies Rock! Bedard Dazzles! For the first six innings tonight I watched the Mariners play yet another horrible, horrible offensive game. In the first inning we had runners on first and third with one out and failed to score. In fact, we even failed to hit the ball as Peguero and Olivo struck out back to back. In the second we had runners on at first and third in a two out rally that was snuffed out by an Ichiro ground out. In the third, Justin Smoak hit a double with one out and never got off second base after two flyouts. Fifth, Ichiro doubled with one out and he too never came off second base. Sixth, Mike Carp got a two out single, but there was never any threat. It was in the seventh that things got started. After Chone Figgins doubled to lead off the inning, Jack Wilson sacrificed Figgins to third, Ichiro was intentionally walked to set up the double play. Brendan Ryan came up to the plate and completely failed as he went down on strikes and it looked as though the M's were going to really blow it again, now having two outs. Smoak started out with a 2 -0 count, so rather than pitch to him Santana gave him an intentional walk to load the based for Carlos Peguero. Peguero fought off a number of pitches and was really swinging for the fences on every pitch. On a 2 - 2 pitch, Peguero hit one up the middle, right at Aybar who was positioned perfectly but the miraculous happened for the Mariners. The ball hit the bag at second base and bounced high in the air and into left field scoring Figgins and Ichiro. That same kind of magic is what beat the Angles last month when Torii Hunter lost a fly ball in the sun as the winning run came into score. Who hit that ball? Carlos Peguero. 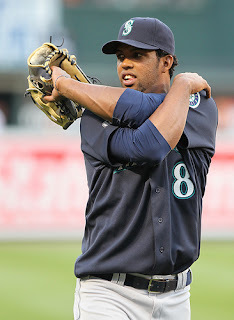 It may be luck, but the Mariners and Peguero will take it here again. After a stellar performance by Erik Bedard through seven innings giving up just three hits and striking out 5 while walking none and leaving the game with a shutout. David Pauly gave up a run in the 8th making it 2 - 1. Greg Halman answered back in the bottom of the 8th with his first career homerun over the wall in center field. Great shot for his first HR. Brandon League came in and shut down the Angels to give the M's the win 3 - 1. The Rangers got spanked 12 - 4 today by the Yankees and helped us get within just one game of first place. Yes, just one game out with an off day tomorrow as the Rangers play the Yankees again. In other news, directly after the game, Dustin Ackley was finally called up to the bigs. Finally! Luis Rodriguez who wasn't getting any playing time at all was optioned to AAA Tacoma. So now we get to see what we've all been waiting for and we know now why Kennedy was taking ground balls at third base the last couple of days. Ackley will be ready to play in Friday's game. Ackley update to come on tomorrows off day. So the Mariners are moving and shaking, still a major struggle on offense, but you have to be impressed with Bedard tonight and you have to love the impact that these young guys are making on the team. Friday we welcome the Phillies into town and I imagine that we will see a sellout crowd at Safeco on Friday. We better see a sellout crowd on Friday.